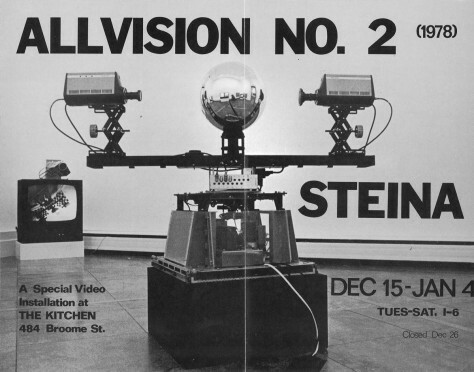 A founding member of The Kitchen, Steina Valsuka returned in 1979 to present video-machine installation Allvision No. 2 in the gallery. Blurring disciplinary boundaries between video, machine, and sculpture, two cameras on opposite ends of a crossbar filmed a rotating mirrored sphere in the center of the sculpture. The mirrored sphere captured reflections so that viewers could see the entirety of the room from nearby video monitors playing the footage live. The mechanical all-seeing eye raised questions about changing perceptions of reality in world of rapidly developing surveillance technology.